As a small business consultant, I get the opportunity to learn and share with other small business owners that include my clients and those in my business network. We work together to improve our businesses, but we also help each other understand life in general. As I look at 2018, I am more thankful than ever that God has blessed me by allowing me to be born in the USA. We have many freedoms including the freedom to operate small businesses and worship where we please. Those freedoms may not exist in other countries. Our country has its issues no doubt. One issue that I have been thinking about is the level of hate that we seem to be experiencing in portions of our country. These mass shootings are terrible. I am all for voicing our opinions, I do it all the time, but the violence is extremely bothersome. Let’s all have a look into our hearts and try to remove any hate or prejudices we might have. Christmas reminds me that life here on earth is very short in the big scheme of things. I need to be ready to go to my heavenly dwelling, the best gift of all, at any time. I do not forget the Christ in Christmas. 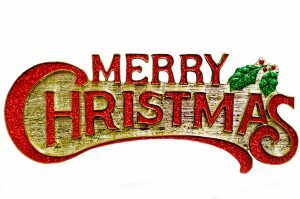 I wish you a very merry Christmas and may God’s blessings be upon you and your family.